This started out as a steampunk version of the Classic Space 918 One-Man Spaceship, but then I got enthusiastic with the steampunkery. The ultimate origins of this model are in my attempt to build a steampunk version of the big 928 Space Cruiser and Moonbase set, but after two aborted tries convinced me that that level of SNOT work was a lot more complex and difficult than I had anticipated, I decided that perhaps the thing to do was to hone my skills on something smaller. 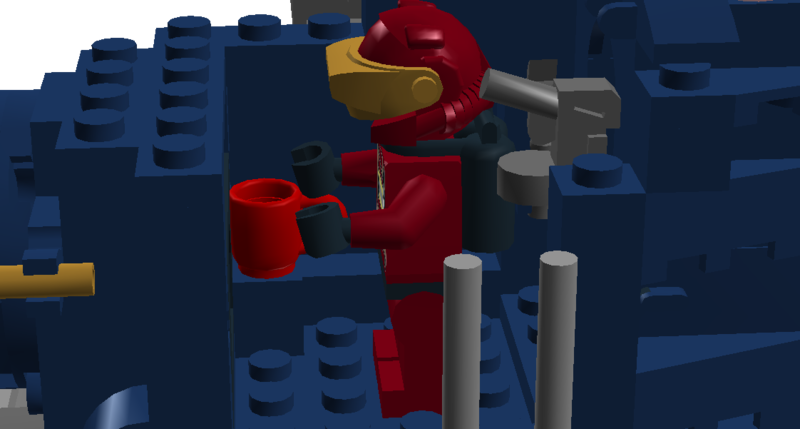 In the course of modifying the design to make it more steampunky, I may have got a little carried away, so that the Classic Space origins of the craft are no longer immediately obvious. 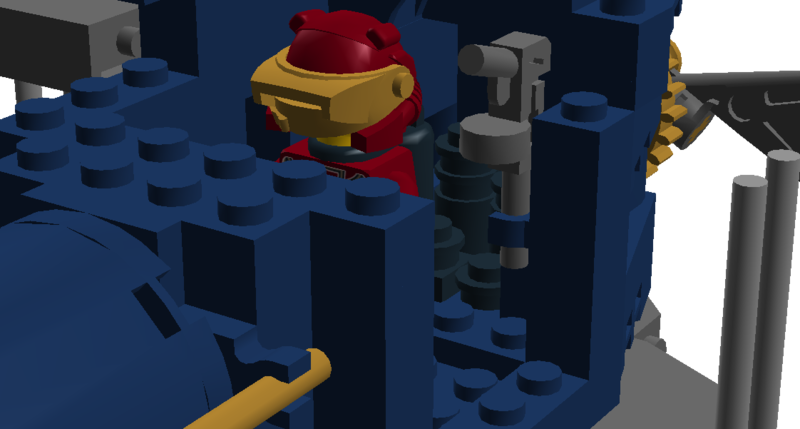 Most of this stems from my decision to make it a biplane, but the locomotive-like steam boiler in front doesn’t help either. I also darkened the colours from the Classic Space legacy blue and old grey to earth blue and dark stone grey in order to give it a smokier, less clean-and-shining feel, and made liberal use of metallic gold brasswork, though it still has its proper trans yellow windows. Still, for all that it’s a pretty nice little steampunk spaceship, and you might be able to see echoes of the original. It has a propeller engine instead of a rocket for flying through the aether, a smokestack where the tail fin used to be, miscellaneous brass gears and a coal bunker around the engine section, and retractable (though sadly not properly stowable) undercarriage. As a first for me, this model incorporates six-directional building in a single structural section (the wing/boilerplate). Cutaway view showing the interior of the cab. I’ve hidden one wall and the upper win g so you can see it better. 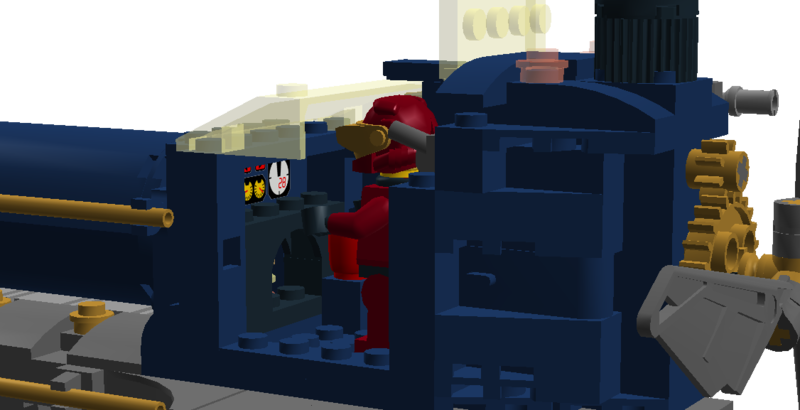 I’m particularly pleased with the interior of the cab, with its firebox, coal bunker, steam gauges and cup of tea for the aethernaut pilot. 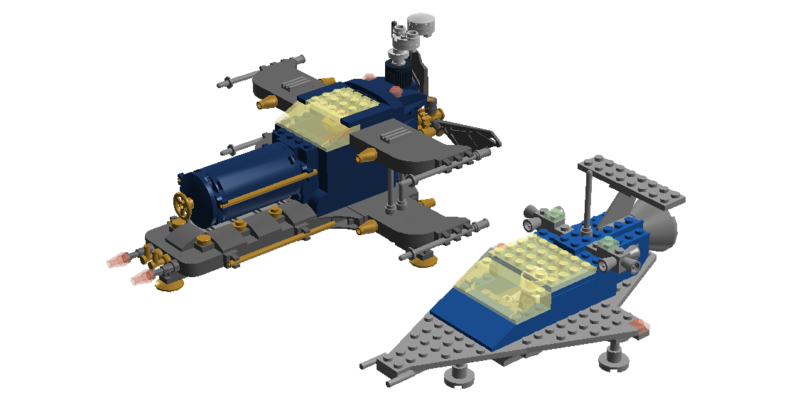 This entry was posted in Lego Classic Space, Steampunk and tagged Aether, Classic Space, Lego, Lego building, Lego Classic Space, Lego Digital Designer, Spaceship, Steampunk on June 6, 2015 by geoffhorswood.